Beautiful, low maintenance custom curbing to match your style. Available in many patterns and colors. Concrete curbing can enhance your landscape. It is the half of price of bricks and is a permanent solution. It can increase curb appeal, decrease the time spent trimming around landscape beds and increase your property value. Mansfield Landscaping can also handle all of your decorative concrete landscape curbing projects as well. Our decorative, stamped curbing is on the cutting edge of landscape design. 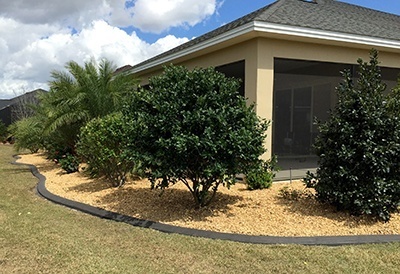 Concrete curbing is professionally installed, permanent, attractive concrete border edging that provides great additions and solutions to any landscape and serves as a weed and grass barrier by outlining flowerbeds. Mansfield Landscaping decorative concrete curbing can be installed around trees, flowerbeds, sidewalks and just about anywhere you like. Our curbing comes in multiple shapes, colors, stamp patterns, and textures; including brick, stone and slate - and we will create customized profiles and impressions upon request.